New York (TADIAS) – It is poised to be an exciting summer for Ethiopian music on the East Coast with live concerts that include the highly anticipated U.S. debut of Jano band; the Addis Ababa-based duet, Munit and Jorg; the return of Fendika direct from Ethiopia; a joint performance by Teddy Afro and Mahmoud Ahmed; as well as the first American tour by The London-based trio, Krar Collective. Jano, which leads the pack in publicity and expectation, was recently featured on CNN in preparation for their upcoming show at the historic Howard Theater in Washington, D.C. on July 4th. 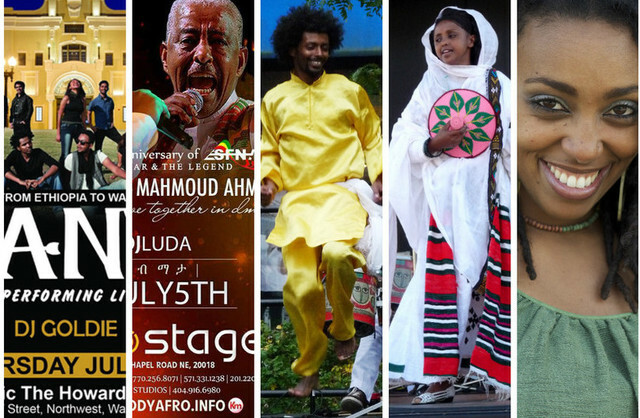 The super-group Fendika that consists of six world class dancers and Azmari artists, once again bring its exhilarating mix of Ethiopian music and dance to audiences in the United States, highlighting the wealth of diversity of Ethiopia’s musical traditions. Fendika is currently in the Midwest, and is scheduled to perform on July 2nd at the Smithsonian Museum of African Art in Washington D.C., followed by a concert at the Lincoln Center Atrium, in NYC on July 4th, as well as in Boston at Hibernian Hall on July 7th. Living legends Mahmoud Ahmed and Teddy Afro will share the stage on July 5th at Echostage in D.C.
Also in Washington, we are told, Ethiopian and German duet, Munit and Jorg, will launch their U.S. tour with a concert on July 1st at Tropicalia Dance Club. Organizers said the show will open with a performance by Feedel Band and will be hosted by the Seattle-based hip-hop musician Gabriel Teodros. Below is a slideshow of flyers and photos courtesy of the promoters. Fendika Back in the U.S. Learn more about Munit and Jorg on their Facebook page.